- I recently picked this up for $12 used. I played it on my 60gb ps3 with a dualshock 3 (lots of rumble support). - I've finished and loved ICO and always planned to try this game out especially with all the great reviews. So I'm 3 yrs late to the party but I finally got to it. - It's just you, a sword, bow and arrow, and your horse Agro and 16 epic boss fights. Each colossus is like a puzzle platformer where you have to figure out how to reach these glowing weak spots on the colossus and stab them with your sword. - The graphics are pretty darn impressive for PS2. It supports 480p and wide screen which is a nice touch. The sense of scale is just epic, and I'm not just talking about the colossi. Some of these "areas" you fight in just stretch on for what seems like forever in all different directions. The draw distance is pretty good. The atmosphere it creates is just off the charts. - To do all that it really punishes the ps2. The frame rate can get into the single digits sometimes which is rather annoying but didn't effect game play much. What is much worse is the camera. I HATE THE CAMERA!!!!! You have to often mess with it manually. The L1 focus on the colossus kind of helps. Often times when scaling the big baddie I'd get a close up shot of it's hairy arm pit and nothing else! The camera is by far the biggest issue with this game and it really does detract from the game play. It happens often enough to become more than just an annoyance but you can work through it. - Crazy abundant usage of particle effects. At times so much dirt, sand, and dust gets thrown up it's really hard to see. - Really good animation and physics that affects game play. - The music is fantastic and fits the game perfectly. I really like how it changes and picks up once you find a way onto a colossus. It's truly some nail biting intense stuff. 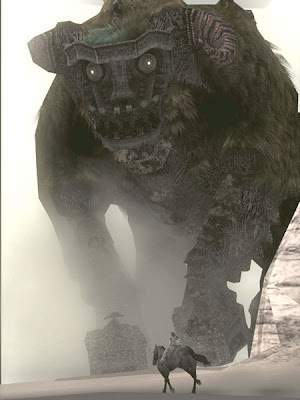 - The game took about 10 hrs to finish but a lot of that depends on how long you get stuck on some of these colossi. The ones toward the end are some real head scratchers. I guess the solutions make some logical sense but man does it take a lot of experimentation. The later ones you really have to examine the environment and see how they would give you an edge. I would say about 3 of them really had me stumped which I had to consult gamefaqs. I was running out of patience and at that point I just wanted to see the ending. A lot of thought and creativity really did go into each colossus encounter. I was surprised that my parents and in-laws (visiting over the weekend) really enjoyed watching me play this game and help me figure out ways to tackle the colossi. - The controls take a bit of getting use to. Once you understand the jump/grip mechanic things go a lot smoother. Make sure you charge your sword for massive damage! The horse though took longer to get use to. It really does have a mind of its own. Steering is a bit difficult but stopping Agro is even harder. Pulling back on the reigns just doesn't stop it quick enough. Usually jumping off is the quickest way to stop. This horse needs brakes! But by the end I got pretty good controlling Agro, and you need to for some of the later Colossi. - It always asks you to save after you defeat a colossus. There are also shrines scattered around that act as save points. You always get an invisible checkpoint when you start a fight with a colossus. Frustration wasn't too bad. Survival isn't too hard. If your health gets low just find a place to hide and crouch to heal up (R1). Also, you can fall ridiculous distances with little damage. - The ending is long and pretty good. The story is open to quite a bit of interpretation. This is made to be a prequel to Ico since your Character Wander is an ancestor of Ico. - All the cut scenes are done in engine real time. You get limited camera control with the right stick. Just watching the world scenery (especially the intro and ending) is beautiful even on the PS2. It's amazing art direction with that distinctive Ico look of muted colors and high contrast (though I think the fake over blown HDR lighting is a bit over done sometimes). There is an in game brightness slider. Sometimes the lighting shifts dramatically especially when you use your sword to find a colossus and then turn it off you'll see the entire world brighten then darken. It's a bit jarring and glitchy looking but this is a minor nit pick. - I wonder what this development team has been up to for the last 3 yrs. I would love to see something from them on the current generation. I guess they are working on this for the PS3. It's not much to go on. Recommended. I enjoyed the look/atmosphere, the basic gameplay mechanics, and story. If you can get past the bad camera there's a really great game here.